Dragon Bet Roulette is the high odds twist on traditional or European roulette, with a standard roulette wheel paying odds of 36/1, plus the addition of what is effectively a side bet that pays up to 350/1. To play Dragon Bet Roulette, simply place your bets in the usual way, with a minimum of 20p per chip. These chips can be placed on streets, corners, splits, outside bets, and of course straight up. The minimum cost per spin of Dragon Bet Roulette is £1, as are the outside bets. Once you are happy with all of your laid bets, you can either spin the roulette wheel to play the standard game of roulette, or you can place additional chips on the Dragon Bet Roulette table. These additional bets can be a minimum of 10p, up to £1.40 on a straight up bet, however the maximum bet may vary depending on what you have on its sister number on the main roulette game. As with all FOBT roulette games, the maximum win per spin is £500, so if you have £10 on number 11, you will only be able to place 40p on number 11 on the Dragon Bet table to take your maximum possible win up to £500. The main roulette wheel pays standard odds of 36/1. The additional Dragon Bet Roulette wheel pays either 150/1 for a green Dragon, or 350/1 for landing the golden Dragon. These bets are paid in addition to the main roulette table. A £1 win with the golden Dragon will pay £350, plus the amount that was laid on the 36/1 wheel, which turns a close succession of wins into a large bank balance. However the long odds of a couple of successful hits make this scenario not too common. 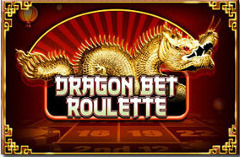 Dragon Bet Roulette isn’t currently available online, however the games creators; Inspired often convert their games for inclusion in online casinos, so it is possible that Dragon Bet Roulette will be playable online at a future date. For now you can play Dragon Bet Roulette in William Hill, Betfred and most independent bookies.